Clay and concrete roof tiles have a long history and a good track record. Manufacturers typically guarantee the tiles for 30 years and suggest that 60 years is a reasonable service life. But can they last longer? While clay roof tiles have been used on roofs for centuries, concrete tiles have become more widespread over the last half a century. Manufacturers of both clay and concrete roof tiles typically guarantee their products for 30 years but often suggest that 60 years is a reasonable expectation of their service life. 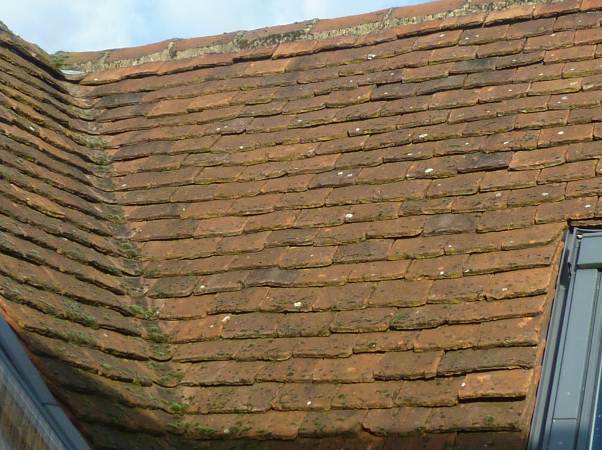 BRE was recently contacted by two different clients, each concerned about the lifetime of their roof tiles, now around sixty years old. Would, for example, these tiles need replacing or could the roofs be left in their current states without any further action? Given these concerns, we set out to inspect roof tiles of this age to see if they were ‘past their best’. This has not been a straightforward task as no in-service test currently exists for any roof tile. However, a good starting point has been the British Standards for clay and concrete tiles, which both contain a series of tests aimed at determining the suitability of new tiles during production. The test methods include a range of testing parameters, such as dimensional regularity, width, flatness, freeze-thaw resistance, flexural strength and water impermeability. The dimensional and flatness measurements are not applicable to tiles that have already provided years of good service. Similarly, the freeze-thaw resistance test, which looks for cracking, flaking and splitting of the tiles after a series of freezing and thawing cycles, is not appropriate for tiles that have withstood winters since the 60s. However, whilst on the roof, the tiles must have sufficient flexural strength to resist the forces that they experience from the wind. This is principally an up-lift force, tending to lift the lower edge of the tile. The Standards require the tiles to have a minimum flexural strength of 600 N for clay tiles and 550 N for concrete tiles. By measuring the flexural strength of a set of tiles that has been removed from several areas of the roof, it is possible to determine whether they meet the minimum strength requirement. The other test method in the Standards that is applicable to tiles that are in service, is the water impermeability test. This determines whether a tile is so porous that water can seep through it. Tiles are bonded to the bottom of frames that are then filled with water. The test is passed if no water drips from the bottom of the tile within 24 hours. The results of these tests revealed that the flexural strength of the tiles was quite varied. But the vast majority exceeded the minimum strength value laid out in the British Standard, and all of the tiles passed the water impermeability test. The durability of a roof is governed by the condition of many different components, including the timber battens and rafters, the underfelt, the roofing nails and the quality of the installation. But based on the results of the laboratory tests, BRE has every reason to believe that even after 60 years of wind, rain, snow and hail, the tiles could keep going for several decades more.